Well, so I'm going to toot my own horn today and talk about a kitchen I did for a client! LOL. So as many of you who have worked in a typical office before, you know that office kitchen... dingy, depressing, institutional coloring, cabinets that belongs to your super dated doctor's office. Yeah, you know what I'm talking about. Guess what, for a little bit of money and some elbow grease, it doesn't have to be that way. This kitchen make over idea can also apply to your own home kitchen as well. So the dilemma is this: how to make over a kitchen for as little bit of money as possible while still REVERSIBLE in case the landlord wants the old ugly kitchen back (although I can't see why but hey you never know)! 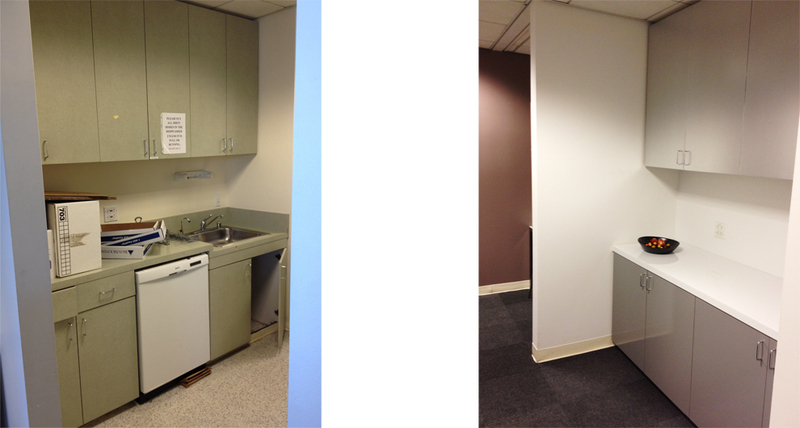 The picture on the left is left side of the kitchen (before) and the picture on the right is the right side of the kitchen (after). Here's what I did. I covered the top cabinet with stainless steel sticky back stickers. Just remove the cabinet and essentially wrap the cabinet faces with stickers. These stickers come in a roll, you can just google it. They are everywhere. Then for the bottom cabinet, I used a sticky back sticker that looks glossy (the kinda have lacquer effect) and stick it onto the bottom cabinets. Then for the counter top, I used 1/8" white acrylic panels and just tape them down with double sided tape (just go to your local hardware store and ask for the industrial strength ones). You have to be somewhat patient with this because it does take awhile to measure all the surfaces. Just seal all the edges with silicone caulking. For the floor I laid down carpet tiles I got from Amazon. Material cost for the whole kitchen was less than $1200. Now the kitchen looks sleek (and reversible) without breaking your bank. How cool is that?